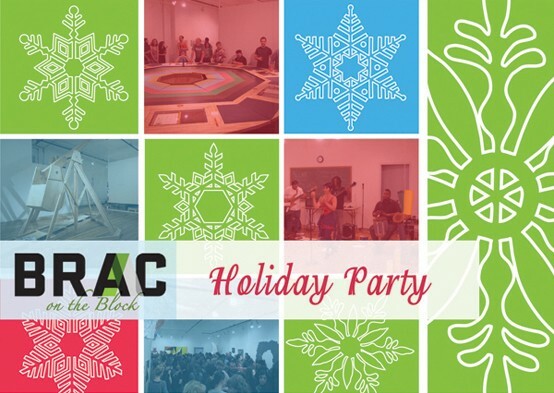 Bronx River Art Center :: Events :: Please join us for BRAC's Annual Holiday Party! home > events > past > Please join us for BRAC's Annual Holiday Party! View the Weather Reports recorded during SP Weather Station's Roundtable Event and have the chance to create your own. Participate in a Holiday Dance-Off with music provided by Action Club, Elizabeth Hamby and Hatuey Ramin-Fermos, the artists currently exhibiting in the gallery. Many of the Shifting Communities artists will be on hand to facilitate the creation of Holiday Mixtapes complete with custom album covers to take home as gifts to friends and family. Artist Jules Rochielle will be present to involve participants in Listening Sessions for her online audio archive, Social Practices Art Network (SPAN). Food and Drink will be on hand! Come toast with us to Holiday Cheer!